Before the Great Union of 1918, during WWI, which was a difficult period for the Romanian Kingdom, as most of it was under German occupation at that time, not only the soldiers on the frontline proved to be real heroes. Women also had a significant contribution to Romania’s war efforts by getting involved in a series of activities from raising the morale of the troops to charity and diplomatic events. 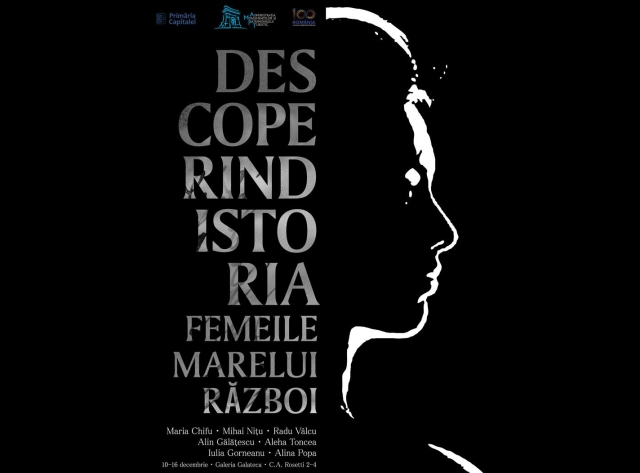 A vintage photo exhibition, which also had on display documents and manuscripts, has been recently mounted by the National Archives in an attempt to highlight the activity of several remarkable women, who were also precursors of the Romanian feminism. Here is now Monica Negru, curator of this exhibition entitled “Discovering History. Women of the Great War” with more on the activity carried out by these women. She starts with Alexandrina Cantacuzino, a symbol of the feminine movement of the inter-war Romania. After the war, Alexandrina Cantacuzino continued her activities of helping the girls who lived on limited means and the emancipation of women in general. Alexandrina Cantacuzino supported the foundation of Women’s Little Entente, bringing together women from Romania, Poland, Czechoslovakia and Greece. In 1923 and 1924 she was the president of the body, while between 1925 and 1936 Alexandrina Cantacuzino was vice-president of the International Women’s Council. She lived a very long life, dying in 1944. Alexandra Cantacuzino’s activity enjoyed the support of Alexandrina Falcoianu. With details on that, here is Monica Negru once again: “Alexandrina Fălcoianu was born into an old family of Wallachian boyars. Her father was a mathematician and university professor in Bucharest. Her first cousin was Elena Vacarescu, together with whom she lived in the west for a while. Alexandrina Falcoinanu wrote her memoirs, whose manuscript version is preserved in the National Archives. During the Balkan War years she took a course for voluntary nurses. She became a member of the Balkan Red Cross, she was constantly active, even on a Romanian ambulance sent to Bulgaria in 1913. In 1916 when Bucharest was conquered by the Central Powers, she set up a canteen near Titu railway station, close to the capital city, where she offered soldiers a daily hot meal. There, those who had sustained injuries, received a bowl of broth, a quarter loaf of bread and tea, that is 40,000 soldiers a day, on an average." Speaking about that, here is Monica Negru once again: ”Zoe Ramniceanu, a prominent member of SONFR, was one of the founding leaders, acting as a general treasurer. During WWI, she was a medical trained nurse with Hospital 113 in Bucharest, jointly with Alexandrina Falcoianu. The two served time in prison for a short while, on charges of taking action against the then German occupation. Zoe Ramniceanu was a member of the Romanian Red Cross, activating continually to help Romanian prisoners and visited concentration camps. Starting December 1st, 1916, she provided food and medical care for the 4,000 prisoners in the Capital city." Alongside those women, in the first years of Greater Romania, there were other women, who compelled recognition, as philanthropists and social activists, but also as promoters of arts and science.